Antique Japanese teacups are beautiful examples of Asian craftsmanship. The term can refer to any teacups made in Japan until about 1952, although anything made after 1910 would be more correctly termed vintage. Japanese teacups and other pieces were exported to Europe beginning in the 1500s. The dynasties can be broken down into the following time periods. Teacups may be marked with Japanese characters identifying these dynasties but it is necessary to have an expert translate the markings. While a teacup marked with the Japanese character for a dynasty can help you estimate its age, it's also important to note the type of teacup and the patterns on the cup itself. Japanese teacups are identified more with their city of origin than with the dynasty in which they were made. Japanese teacups come in hundreds of patterns which are often identified with the city of origin rather than the pattern itself. Bizen pieces are decorated with humorous figures of gods, animals, and birds. Kutani is characterized by elaborate decorations in gold, red, and other vibrant colors. Satsuma has a crackled, ivory luster finish and are decorated with a picture of Japanese craftsmen painting vases at a table. 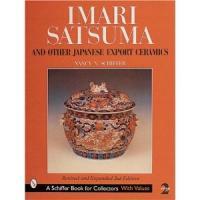 Imari usually has an underglaze of blue and rusty red on a white ground. Leaves and flowers are depicted. Moriage is a type of decoration that has been used on Japanese pottery for centuries. It is a process of delicately layering clay on pottery to create intricate, raised designs. They may then be painted in vibrant colors or have gold leaf added to them. This type of pottery is easily damaged if not handled carefully. Not all Moriage pieces are antique so always know who you are buying from and learn as much about the authentic antique pieces as you can. A famous type of Moriage is called Dragonware. This has dragon designs created with the Moriage technique and was used by many manufacturers. Although there were hundreds of manufacturers some are better known and highly collectible than the rest. They can often be identified by the individual backstamps, but there are hundreds of these. Here is an assortment of Japanese marks but the collector will want a more comprehensive reference such as, Imari, Satsuma and Other Japanese Export Ceramics by Nancy N. Schiffer. Recent Japanese teacups and other china can be dated according to a simple set of criteria. Until the 1950s backstamps were engraved or written on the teacups in indelible ink, making it a simple matter to figure out the approximate age of a piece. Many of the antique teacups that you find may have a Nippon mark on the bottom. This means that the piece was made in Japan between 1891 and 1921. Nippon does not refer to a company or a place; rather it refers to the era in which the piece was made. The Nippon pieces were made primarily for export; little of it was used by the Japanese people themselves. Items that were made during this time are inscribed with NIPPON or Made in NIPPON. They may have Japanese symbols as well. This was in response to the United States passing the McKinley Tariff which required that all imported goods be marked in English with the country where they originated. 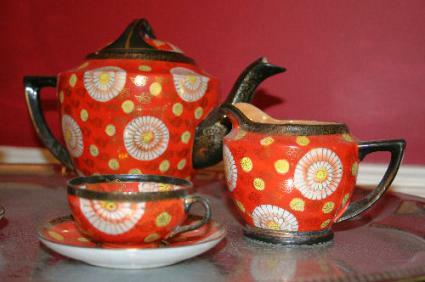 Beware of sellers that use the label Nippon for any Japanese porcelain or pottery. Only those items marked Nippon are authentic. This backstamp is more valuable than the Made in Japan stamp also used during this time. Eventually U.S. Customs ruled that Nippon was no longer an acceptable term for imported Japanese china. Beginning August 1, 1921 all imported goods were backstamped Japan or Made in Japan. These marks were used until 1941 when World War II began and the United States placed an embargo on Japanese products. There were no shipments of Japanese products into the United States for at least two years after the War was over. From 1952 on most imports have a Made in Japan sticker rather than a backstamp on the item itself. Since Japan was no longer an occupied country items were marked simply Japan or Made in Japan. Buying antique Japanese teacups that were made after 1891 isn't difficult; they can be found in most antique shops or online. The markings make it easy to identify the era, if not the exact manufacturer. Buying very old teacups, however, can be daunting. Make sure that you deal with an antique dealer that is experience in oriental antiques and has good references. Although it can be tempting to try to evaluate your Japanese antiques on your own you should get an expert to do it for you. This is especially true if you suspect you have a teacup that was made before 1891. You can find professional appraisers by contacting the American Society of Appraisers. Collecting antique Japanese teacups and other porcelain items allows you to enjoy some of the finest craftsmanship in the world on a daily basis.